« Gaddafi Dead, But What Will Be The Blowback? This entry was posted on Friday, October 21st, 2011 at 06:45 and is filed under Barack Obama, Election 2012, Global Revolution, News, Occupy Wall Street, Politics. The sad facts are now coming to light at an alarming rate as Americans are waking up to the new reality in America: Barack Obama never intended to get us out of that ditch into which he says George Bush drove us. Instead, as Rush Limbaugh warned when he said he hoped Obama would fail, it’s clear that Obama has no intention of getting us out of the ditch, and is instead converting our economy slowly but steadily into a third world train-wreck. Now we have news that the standard of living for Americans is in steep decline, and worse, new unemployment claims have again topped four-hundred thousand, demonstrating that we aren’t likely to climb out of this ditch any time soon. Rather than calling a wrecker to recover our mired vehicle, Barack Obama is burying it there, and us with it. The truth is being revealed in virtually every direction we look, and as the mainstream media scurries to help hide it from us, it’s become too obvious for us to ignore: Barack Obama and all his leftist friends are in the process of dismantling this country, and they are the obstacle to our recovery, and increasingly, our very survival. Barack Obama is accomplishing his mission, and there’s no disguising it any longer. This is not accidental. There isn’t enough incompetence in the world to explain the rate of decline or the manner in which it’s being accomplished. The last deficit of George Bush was something just over $400 billion. That’s a stack of cash, to be sure, but it’s roughly one-fourth of the deficits we’ve racked up in each of the three succeeding years under Obama. This is all being financed by borrowing more money into existence, and the sad fact is that each dollar printed is bringing us closer to total collapse. Of course, when you tell this to the average American, they shrug, and look at you as if you had told them their socks had static cling. Americans have become so conditioned to nothing but bad news on the economic and financial fronts that they no longer bat an eye at the most calamitous predictions. Most simply can’t bear to hear any more of these ill tidings, but we must make sure that at the very least, they know who is responsible. If Barack Obama had been merely incompetent, his actions and ideas might have stood a chance of being positive for our country and its ailing economy at least some of the time. As it is, however, everything he undertakes is a failure, at least by our reckoning. Through the lenses of his statist world-view, he is being incredibly successful at righting the wrongs of evil capitalism. The problem is that he’s not interested in capitalism. What drive this Marxist is a desire for vengeance against what he sees as people who have wronged the world: Americans. You consume too much. You have too much wealth. You have too much global influence in proportion to the world’s population. It is the very fact and state of your existence that brands you as evil in the hand-book of the left. This is why you’re going to be looted for as long as they can get away with it. What do you think is the possible meaning of the story about which Sarah Palin tweeted her outrage over on Thursday night? Your money and wealth, and the future of your country is being shipped out of the country as quickly as possible. At his current rate of deficit expenditure,s, you will have pushed six trillion dollars of your future wealth overseas. The Federal Reserve continues its money-printing ways, and with each additional dollar they put into circulation, the value of your existing dollars is being diminished. This is a criminal enterprise operating openly under the protection of law. Add to this the fact that Obama’s foreign policy seems designed not only to put America at greater risk, but also to strengthen its enemies around the globe, and one begins to wonder about the nature of this president’s intentions. Notice that he is expending great amounts of our defense capacity in displacing various military dictators in the Arab world, and that by so doing, he’s making the Muslim world safe for radical Islamists, and you begin to wonder what it is that he has in mind. Frankly, like many Americans, I’ve begun to wonder seriously where his loyalties lie, and whether he’s a “natural born citizen” or not, he certainly is behaving like the sort of foreign usurper that term in our constitution was intended to prevent. Even as an American citizen, his actions are those of a foreigner, and his views on our country and its people, as well as its constitution and system of law and economics is foreign to our country. Now come the Occu-Pests, and they represent a real threat to the future of our nation. While he turned up his nose at the Tea Party, he welcomes these Marxist “useful idiots” with open arms. This can hardly be coincidental. As all of this goes one, we are right to begin asking ourselves and our fellow Americans what we will get if this president has his way with our nation. He must be stopped, but we won’t stop him with a moderate or progressive Republican. We won’t defeat him if we put up a guy like Mitt Romney. I’m afraid our nation is in grave danger under the threat posed by Barack Obama and those with whom he has surrounded himself. It’s difficult to find a single one among them who does not have ties to the most radical and anti-American groups in the country, or in the world. He is slowly accomplishing his mission, but none should fall prey to the notion that he is done, or that if we hold an election, that he will go quietly. His crowd of thugs stand ready to pull out all the stops as they’re putting together their own constitution, and seek to put our nation on its knees so they can more easily wreck it. Every rational American should be considering the meaning of all of this, and we must begin to make it clear to our friends and family members who don’t pay such close attention. The evidence is everywhere. There isn’t any way we can chalk all of this up to mere incompetence. Our decline is being engineered, and worse, they’re using our virtues against us to do so. If we permit Barack Obama to accomplish his mission, this nation will perish. 15 Responses to Barack Obama: Mission Accomplished? And with the complicity of the current Congress, we are boxed in, on all sides, until this time next year; of course that assumes we still have our basic rights and that it will actually mean something. You're just gonna love the Ron Paul supporters who have vowed to vote for Obama or at least writie in Ron Paul in the General Election if Ron Paul doesn't win the primary… so we'll have Obama 4 more years. I asked them why they would do such a thing, and they said they don't care. "If Ron Paul isn't in, it may as well be Obama." I went to the "Ron Paul" Facebook page w/555,000+ likes…and they are circulating a petition to encourage peope to do this. I find this appalling and irresponsible for anyone who considers themselves a Republican or conservative to take action that might keep Obama for 4 more years. I think Herman Cain could take him out. I dig Ron Paul, but I don't think that's gonna happen…. Yes, we are in deep poop. I wish I had kept a diary on BHO from his speech at the Dem convention in 2004 to today. Every day, I mean every day there has been negative actions, reports, radical associations, poor decisions, bad legislation, radical ideas and on and on. Every day it's something else. Maybe I watch too much Fox news and listen religiously to Rush but whats happening since 2008 is serious. A daily log of all the things that have gone on would make quite a book. "Notice that he is expending great amounts of our defense capacity in displacing various military dictators in the Arab world…"
Nation building and policing the world must come to an end. Either now, or later when we will simply have no choice. To Concerned – To be clear, most Ron Paul supporters see our candidate as the only true conservative in the race. As conservatives, why would we or should we vote for anyone else? The 'lesser of two evils' argument doesn't apply to many Ron Paul supporters. Simply put, most Ron Paul supporters are principled individuals who want a constitutional government. Nothing more, nothing less. We will only vote for someone who we can trust. We will not vote for someone who we can not. How about a Herman Cane / Newt ticket? What a load of crap. As soon as "as Rush Limbaugh warned" was used I knew this was BS. Ron Paul, because of his weak position on national security issues, clearly will NOT be the Republican candidate in 2112. I agree completely with CoachT's reply to SeanStLouis: any write-in vote for Ron Paul is a throw-away vote for whomever the Republican candidate happens to be. Therefore, throwing your vote away on what you Ron Paul supporters consider to be 'principal' is really just another vote for Marxist Bam-Bam. I will personally vote for ANY other legitimate Republican candidate to see Bam-Bam go down in flames! We simply cannot afford this abonimation… or should I say 'Obamination'? Dilbert – I'm sorry, I simply don't believe in the concept of a wasted vote. To use your term, I don't see any other 'legitimate' candidate in the race, so there ya go. I guarantee you that two or three years from now, after you elect your "legitimate" Republic candidate, I'll be right back here saying I told you so. 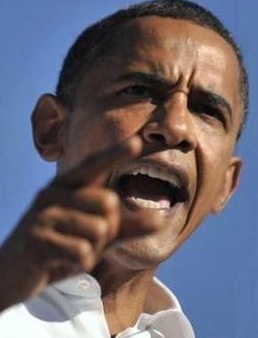 And Coach…I will not vote for Obama, and I certainly would not vote for Bozo the Clown to make my vote "count".